An unusually cool August/September has initiated some early runs of steelhead into the lower reaches of most tributaries in steelhead alley. Movements upstream have been limited so far. 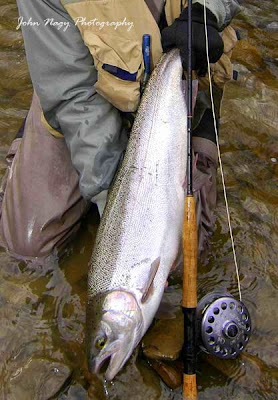 Look for good steelhead runs upstream as soon as fall rains become more consistent. Remnants of a fall hurricane have the potential to provide substantial run-off and excellent runs (both in numbers of fish and upstream movement distances). On September 29, 2013 the Lake Erie water temperature (degrees F) off Toledo was 63, off Cleveland was 68, off Erie was 66, and off Buffalo was 66. Ideal Lake Erie lakeshore staging temperature for fall steelhead (prior to running into the tributaries) is 68 degrees F.
Additional stockings include 21,050 adult Ganaraska Strain steelhead by Ontario and 18,000 yearling steelhead by Pennsylvania (which came from the 3CU Sportsman’s Club). This September the US Fish & Wildlife Service (US F&WS) finished work to inventory sea lamprey larval habitat and estimate the abundance of sea lamprey larvae in the St Clair River (which is thought to be a major contributor to the parasitic sea lamprey population in Lake Erie). Preliminary data shows that the sea lamprey population in the river is widespread and of very low density. Michael Fodale of the US F&WS says the dispersed nature of the larvae will complicate plans to remove the larvae in an economical way. The US F&WS also has an ongoing marked sea lamprey study which should be completed in the spring of 2014. The study has been designed to determine if marked sea lampreys released in the St Clair River can survive and be recaptured in eastern Lake Erie tributaries, demonstrating the feasibility that parasites could actually escape from the St. Clair River to successfully migrate to eastern Lake Erie. The US F&WS will be summarizing the data from the studies and making a recommendation to the Great Lakes Fishery Commission as to the best approach to reduce the number of sea lampreys in Lake Erie. The increased sea lamprey population in Lake Erie (which is four times the target limit set by the US F&WS) has been documented by wounding rates on lake trout, sea lamprey nest counts, and spawning phase sea lamprey trapping as reported by the Lake Erie Cold Water Task Group Committee. This population increase occurred despite consecutive 2008 and 2009 US F&WS lampricide treatments of several key Lake Erie tributaries (follow-up post treatment larval surveys showed the tributary treatments were successful). All indications are that there must be an untreated source contributing to the sea lamprey population in Lake Erie (possibly the St Clair and Detroit Rivers). The Illinois Department of Natural Resources has verified that last June a spawning population of Asian Carp has moved to within 25 miles of an electric barrier in the Chicago area waterway system. If Asian carp can breach this barrier (lab testing has shown that Asian carp fry are less adversely affected than adults by the charge of an electric barrier), and reproduce throughout the Great Lakes system, it could disrupt the Lakes’ 7.5 billion commercial and sport fishing economies as well as its ecological systems. The US Army Corps of Engineers is scheduled to complete a long anticipated Great Lakes and Mississippi River Interbasin Study (GLMRIS) in December. The purpose of GLMRIS is to come up with a plan that prevents the transfer of aquatic nuisance species (like Asian Carp) between the Mississippi River and Great Lakes basins. Since Congressional authorization is needed to implement any recommendations by the GLMRIS plan, a considerable delay could occur before any governmental actions are taken. The Great Lakes Restoration Initiative for 2014 was funded $210 million dollars by Congress this past August (less than half of the $475 million President Obama authorized in his inaugural 2010 budget but greatly more than the paltry $60 million initially budgeted). The monies will be used to continue the cleanup and restoration of the Great Lakes. 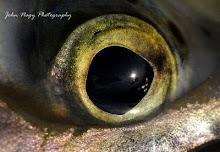 The Lake Erie Cold Water Task Group was asked by the Lake Erie Committee of the Great Lakes Fishery Commission to draft a proposal for tagging Lake Erie steelhead smolts (yearlings) by the various fishery management agencies of Lake Erie. This is in response to a mass marking/coded wire tag study on steelhead that is being done on Lakes Michigan, Superior and Huron beginning in 2013. The tag study will help evaluate steelhead natural reproduction, stocking methodologies, straying, exploitation and survival. Crucial to the study will be collecting a sufficient amount of post tagging data from adult steelhead. In Ohio, the Lake Erie Cold Water Task Group has learned that the Harpersfield Dam on the Grand River is in such a state of disrepair that repairing it is no longer an option. The US Army Corp of Engineers (which is overseeing this project through the Great Lakes Fishery and Ecosystem Restoration program) is considering other alternatives. They include maintaining status quo, rebuilding onsite, or rebuilding further downstream. The Corps is presently consulting with the engineering company Tetra Tech to determine the feasibility and cost of each option. Any rebuilding options will include the integration of a sea lamprey barrier design. The Ohio Central Basin Steelheaders and Cleveland Metro Parks are holding its 2013 Steelhead Expo on October 5th, 2013 from 9:00 AM to 5:00 PM at the Rocky River Nature Center. Admission is free and will feature all day seminars by steelhead experts, local tackle shops and vendors, fly tying, raffles and more. In Pennsylvania, the GEM City Fly Tiers, the S.O.N.S. of Lake Erie and the Pennsylvania Steelhead Association will be selling raffle tickets to benefit the Landowner’s Fruit Basket Program. Monies from the raffle are used to buy fruit baskets for private landowner’s (given out during Christmas) who keep their properties open to fisherman along several Erie County steelhead tributaries. Last year’s raffle resulted in over 130 baskets being delivered. 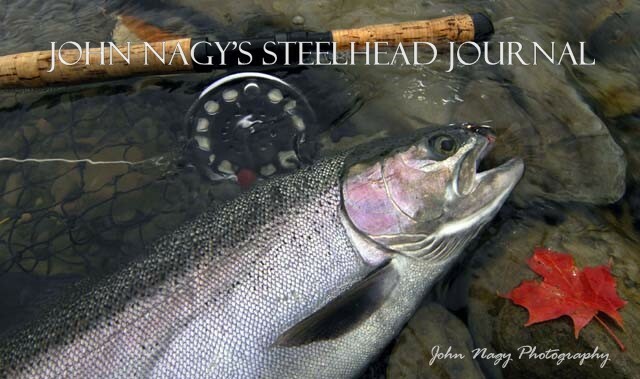 A custom made “noodle” fly rod by steelhead fly fishing guide and author John Nagy will be used as a fund raiser for the raffle tickets. 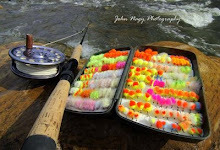 See sidebar for more details on John Nagy’s noodle fly rod. The Pennsylvania Fish & Boat Commission (PF&BC) has amended creel limits for the Lake Erie tributaries (including Lake Erie and Presque Isle Bay) for the Sept. 3 to April 10, 2014 period to include a total of 3 trout and salmon (only 2 of which can be lake trout) with a minimum size of 15 inches. The PF&BC is now offering a 3 and 5 year multi-year fishing license which includes over $300 in free goods and discounts. On 4 Mile Creek (where a fish ladder and bypass were completed last year) the Lake Erie Region Conservancy has purchased a 770 ft. stretch of the creek just north of the Dollar store (along Water Street in Wesleyville Borough) toward the RR tracks. This provides additional public fishing access upstream of the fish ladder and bypass (other public access on the creek includes Napier Park, Cumberland Park and the Penn State Behrend Campus which is also known as the Wintergreen Gorge area). In the fall of 2012, Chuck Murray, a senior aquatic biologist with the PF&BC, began a population study of adult steelhead at Godfrey Run (a nursery stream used for the collection of feral brood stock for the state’s steelhead hatchery program). The study will use an artificial trap (operated 10 times per month) to monitor both adult returning steelhead and emigrating steelhead smolts in the spring. Results from the 2012 assessment (fall/winter) showed peak months for steelhead counts were November and December. The mean length of steelhead (both sexes) was 23.15 inches, with females averaging 24.02 inches and males averaging 22.2 inches The average length of males was decreased by the presence of jack’s (14%) in the sample. The largest steelhead measured was a female at 31.89 inches. Out of the 405 steelhead sampled, 40 sea lamprey wounds were detected for a 9.9% wounding rate. Attachment of parasitic copepod (a minute crustacean) was observed on 47% of all fish examined. In New York, Jim Markham, a senior aquatic biologist with the NY Department of Environmental Conservation (NYDEC), relates that the Chautauqua Creek Restoration Project took a devastating blow this past year as a result of major flooding from super storm Sandy (October) and a winter rain/snow-melt flooding event (February). On the upper dam, an installed rock ramp failed with debris from the ramp washing downstream and plugging the lower dam (preventing fish passage). An access road to the dam projects was also taken out by the floods. Estimates for replacing the upper dam rock ramp (with a “pinned” design which should weather future flooding) and removing the debris from the lower dam, range from $170,000-$600,000. Future funding for this project (which is problematic) would come from the Army Corps. of Engineers and match funds from the NYDEC and the Village of Westfield, NY. In regards to the Cattaraugus Creek Restoration Project, Markham says the feasibility study for the project should be completed by the end of 2013. The preferred design modifications on the Springville Dam by the Army Corps of Engineers are a fixed design (versus an inflatable/removable barrier) where the dam is lowered to 10 feet high. The fish passage section will have a rock ramp and a lamprey barrier at the lip, and includes a trap and sort. The 2011-2012 tributary angler survey conducted by the NYDEC on it’s Lake Erie tributaries showed a 42% decline in salmonid catch rates (from 0.60 to 0.35 fish/hour) and a 47% decline in total catch, compared to the 2007-2008 angler survey. In contrast, the 2011 and 2012 NYDEC tributary angler diary program showed an increase. Jim Markham says there has been an overall decline in steelhead catch rates in all the tributaries in Lake Erie in recent years. On the New York tributaries of Lake Erie he speculates several factors may be contributing to this decline including: the smaller average smolt size planted by the NYDEC, the substantial increase in sea lamprey populations in Lake Erie, and discontinuing domestic rainbow plantings in the NY tributaries in 2002 (which may have significantly contributed to the fall runs in the New York tribs). The smaller than average smolt size planted by the NYDEC (5 inches) has been a result of the cold water in-flow of the Salmon River Hatchery in Pulaski, NY (which limits steelhead smolt growth rates). According to Markham, only 13% of the NYDEC juvenile steelhead plantings last spring were of size to actually reach the smolt phase. Smaller fish typically remain in the streams and are subject to high mortality rates (and thus contribute very little to the adult fishery). New 2013 fishing regulations on the Cattaraugus Creek Indian Reservation are as follows: 3 day license/$25, season license/$45, 3 steelhead daily limit, lead sinker use banned, no guiding allowed, closed to steelhead fishing Jan 1-March 31 (this may be changed to catch-and-release in the future though).